Cosby visits Patrick Henry Wednesday for the Patriots' first scrimmage of the 2013 softball season, and scrimmage debut of new head coach Shelby Webb. The biggest question will be who will take the mound and attempt to replace Emma Mitchell, the 2012 Group AAA Player of the Year, now at UVA. Cosby lost players to graduation, too, but returns ace Chelsea Whitcomb, who is only a junior but has already verbally committed to Virginia Tech. Game starts at 5pm and we will live tweet! ODAC TOURNAMENT: Jackets Come Back! Down 13 in the first half, 6 at halftime, 15 during the second half, Randolph-Macon went to a tried and true formula to claw their way back into contention in Salem Friday night in their ODAC Tournament Quarterfinal against Guilford. Playing a relentless defense which kept Guilford from making a field goal in the game's final 13 minutes, the Jackets pulled off the comeback victory over the Quakers, 57-56, to advance to the semis. Connor Sullivan led the Jackets with 12 points, followed by Andre Simon with 11, but it was Marcus Badger who had the shot of the game, hitting a jumper with 35 seconds left to give Randolph-Macon their first and only lead of the night. Badger then turned on the defense, blocking a three-point attempt by Guilford's Josh Pittman to help preserve the win. Randolph-Macon, now 17-9, face their arch-rival, and this season's nemesis, Hampden-Sydney, in Saturday night's 8pm semifinal. The Tigers defeated the Jackets twice in the regular season, 70-60 in Farmville January 16th and 66-47 in Ashland on February 6th. Cosby, for the second straight year, brought the Patrick Henry girls basketball team's season to a very sudden halt. Using height in the paint and utilizing relentless half-court defensive pressure, the Patriots could never find an offensive rhythm, while Cosby scored transition buckets off turnovers, building a 22-point lead by halftime en route to an easy 68-31 win. The Titans, ahead 13-6 after one, pushed on the accelerator on both ends of the floor, going deep into their bench to keep fresh legs attacking the Patriot offense. A pivotal 14-2 run, helped in part by Cosby drawing free throws on almost every Patriot foul in the half, gave the Titans (26-1) breathing room. Cosby kept it up after intermission, leading 51-28 after three, as only Summer Price, Amber Lee, and Rachel Adams had scored for the Patriots. Jasmine Pinder scored her only two points of this, her final PH game, at the free throw line in the fourth quarter, the game's outcome long decided. Price led the Patriots with 14 points, and Lee added 11. The Patriots finish the season with a 21-6 record and only lose the Pinder twins, Jasmine and Tyler, to graduation. Summer Price, the Colonial District Player of the Year and a first-team All-Central Region selection, will return a core that includes Amber Lee, Ashley Samuels, Rachel Adams, India Coles, and Chantell Gordon. And, with a core group of developing players ready to come up from JV to contribute, and it looks promising that success will continue for the Patriot girls in the new "Conference 16" in the "5A North" Classification. Now, relive the Mills Godwin Miracle with interviews from Summer Price and head coach Phillip Cobb! Sarah Parsons poured in 27 points while Patrick Henry grad freshman Katie Anderson added 18 as Randolph-Macon upset Roanoke on the road Monday night 72-64 to advance to the quarterfinals of the ODAC Women's Basketball Tournament. Hannah Livermon had 8 points, Lauren Vugteveen had 7, while the fourth freshman, Khajae Hester went four-for-four in a critical late-game stretch to hold off and eliminate the Maroons. Randolph-Macon improves to 6-20 and next plays Guilford on Thursday at 6pm at Salem Civic Center. The Jackets lost at Guilford in their lone meeting of the season, 69-57. Summer Price led the way with 25 points as Patrick Henry held off a fourth quarter Petersburg surge to eliminate the Lady Waves from the Central Region Tournament, 47-39 in Ashland. The Patriots, now 21-5, must next face the team that ended their season a year ago, the Cosby Titans, on the road Tuesday night in Chesterfield. Cosby opened their tournament by disposing of Atlee, 91-34. The Raiders' season ended tonight, but not before earning seven district wins, an 11-11 record, and seeing Stephanie Staples reach the 1,000 point mark for her Raider career! The lone county boys team in the Central Region Tourney, the Hanover Hawks, fell on the road to L.C. Bird 95-65, eliminating the Hawks and concluding their season. There just wasn't enough in the tank for Patrick Henry. Playing their third game in three nights, with Tyler Pinder out due to injury and Summer Price still not 100 percent after an illness forced her to miss Wednesday's night game, Patrick Henry fell at Deep Run 49-39 to complete their regular season at 13-3 in the Colonial, 17-5 overall. The real nemesis on Friday night was turnovers. The Patriots had 25 of them and, by our count, only attempted 15 shots from the floor in the second half, both numbers indicative of a team not getting nearly enough regular offense generated to secure a win. Summer Price scored 16 while Amber Lee added 14 points and 16 boards. Price is now at 993 career points at Patrick Henry, and can reach the 1,000 point barrier when Patrick Henry hosts a first round Colonial District Tournament game on Tuesday. The Patriots finished in a second-place tie with Deep Run at 13-3 (Mills Godwin won the regular season title at 14-2), but, by virtue of Deep Run sweeping the District games against PH, Deep Run will be the #2 seed. You'll recall Patrick Henry's win over Deep Run in December was a non-district game in the Times-Dispatch Invitational Tournament. Leading most of the way with part of their attention seered behind their own bench, Patrick Henry's girls basketball team went cold in the fourth quarter, scoring just six points, allowing Hermitage to storm back to force overtime. The Patriots clamped down defensively, holding the Panthers scoreless until the final 0.8 of a second when Destini Walker hit a meaningless three to cut the final margin to 51-50. Patrick Henry moves to 13-2 in the Colonial, in a tie with Mills Godwin with a game to go in the regular season. Godwin will be heavily favored Friday night against rival Douglas Freeman, while Patrick Henry travels for the third straight night, this time to #3 Deep Run. The Patriots and Wildcats have split two meetings this season. Tyler Pinder won't be available Friday night, and possibly longer. After rebounding the ball in the second quarter, Pinder was fouled by Hermitage's Walker and she fell awkwardly to the floor, then screamed in pain. After a few moments, she was carried off the court by head coach Phillip Cobb and the trainer for Hermitage. Pinder will undergo tests on her knee within 24 hours to determine the injury. We'll keep you posted. Summer Price, who didn't play in Wednesday's win over John Marshall due to illness, didn't start the game. But after Hermitage ran out to a quick 9-2 advantage, Price entered the game, and took over, scoring 32 points, including the game-clinching free throw with 8 seconds left in the extra stanza. Tyler Pinder had a rebound and steal before going out. Twin sister Jasmine scored six points and had four rebounds and two steals, while Amber Lee was a force on the inside rebounding, garnering 19, including a few critical boards in overtime when the Panthers suddenly went cold. Lee scored 8 points. We will live tweet tomorrow night from Deep Run beginning just before 6pm! A brief good start for Randolph-Macon, and a brief comeback attempt early in the second half, were the only bright spots tonight for the Yellow Jackets in their attempt to take down arch-rival, and ODAC leader, Hampden-Sydney. The Tigers held the Jackets without a point for nine minutes in the middle of the first half en route to a 15 point halftime lead, which proved too much to overcome as Hampden-Sydney pulled away for a 66-47 win Wednesday night at a sold out Crenshaw Gymnasium. "You have to give them credit. They came in and played well tonight," Randolph-Macon head coach Nathan Davis said, giving a nod to the Tigers performance. He wasn't entirely unhappy with his defense. It was the offense that never found a rhythm. "I thought we did a good job defensively throughout the game for the most part, but we had a stretch where we turned it over a bunch of times, which allowed them, despite how well we were playing defensively, to get a couple of easy baskets. They had a three that bounced around and go in, and they started feeling good about themselves," Davis noted. The Jackets shot just 26 percent from the floor in the first half, missing all six of their three-point attempts, and found themselves down 32-17 at intermission. But Randolph-Macon stormed out of the locker room on a 6-0 run in 90 seconds to trim the lead to nine. Joe Hassell's jumper with 12:52 to go cut the lead to 35-29, but Hanover High graduate Greg Lewis responded with a big three-pointer for the Tigers, and Randolph-Macon never got within seven points again. Lewis scored 14 for the Tigers. Randolph-Macon was led by Andre Simon and Lamar Giggetts' 10 point efforts. The Jackets, now 8-5 in the ODAC, tied for 4th place with Guilford a game behind Randolph, next face Eastern Mennonite at home this Saturday at 2pm. Two IMPORTANT games tonight: one high school, one college! Patrick Henry's girls team, in a three-way tie for first in the Colonial District, begin a three games in three days stretch tonight at John Marshall at 6pm. Tomorrow they travel to Hermitage, site of their only district loss last season, then Friday they go to Deep Run for the regular season finale. The Patriots and Wildcats have split their two games this season so far (one in district, one meeting in T-DIT Tournament in December). Randolph-Macon's men's team plays their archrival Hampden-Sydney tonight at 7pm before a sold out Crenshaw Gymnasium. The Jackets are riding a five-game winning streak and are in a three-way tie for 3rd in the ODAC (H-SC is #1). The top four finishers get a bye in the first round of the ODAC Tournament in two weeks, so a win tonight would be crucial for R-MC. Follow us on Twitter (@hanoversports) as we will be at Crenshaw, live tweeting tonight's action!! Here's a list of county athletes who signed letters of intent and made college commitments today! Sam Rogers chose Tuesday night to walk on at Virginia Tech, picking the Hokies walk-on offer over Virginia. Rogers told HanoverCountySports.org that Tech's winning tradition and coaching staff did help give Virginia Tech an edge in the final decision. He will be groomed to be a fullback/H-back. Tailback L.J. Jones signed a letter of intent at Morehead State University, an FCS program in Kentucky. Lineman Josh Hutto signed a letter of intent to play for Campbell University in Buies Creek, NC. Campbell, also an FCS program, is in the same league (Pioneer) as Morehead State, so Jones and Hutto will see each other from opposite sides of the field when the two teams meet on October 5th! Donte Haynesworth officially signed with Norfolk State, where he will play in the defensive secondary for the Spartans, joining a team that includes former Hermitage quarterback Brendan Riddick, now a running back at NSU. In baseball, star shortstop Andrew Knizner had made his commitment to NC State months ago. Today's signing was a formality, but cemented Knizner into a program with a legitimate chance to win the ACC and make the College World Series in both 2014 and 2015. In softball, pitcher Shannon Albright chose an interesting path, signing with a brand-new college program at Georgia Highlands College in Rome, Georgia. She will pitch there, her preferred position, which attracted her to the new school, as well as their head coach, Melissa Wood. Chad Jacob is a Keydet! He officially signed this morning with VMI to play football. Head Coach Roscoe Johnson told HanoverCountySports.org he expects five to six more players to make their college decisions in the next several weeks. A lacrosse player, goalie Fitz Rogers, committed to play at Randolph-Macon. Rogers is one of the first lacrosse players from the county to make a college commitment. Lacrosse is now scheduled, pending final approval, to be VHSL sanctioned in the county in 2014. Travis Phillips will continue his track career at East Carolina University. Phillips, who starred at wide receiver for the Patriots football team, will also have an opportunity to play football for the Pirates as well, a team on the move soon from Conference USA to the Big East Conference. Track stars Jessica Shelton and Malina Richardson both signed to attend Radford University! And finally, we broke the news earlier this week that Tyler and Jasmine Pinder, four-year varsity basketball players (and twins), have committed to play collegiately at Bridgewater College. PHOTO GALLERY available at our Facebook page!! 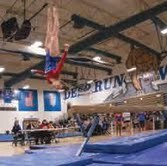 Kristen Valasek of Patrick Henry swept every category Saturday en route to winning the Colonial District and Central Region Individual All-Around Title in the 2013 Gymnastics Championships, held Saturday at Deep Run High School. Valasek, a junior, will be joined by two other county gymnasts in the All-Around category at the Group AAA State Championships February 15 and 16. Atlee sophomore Skylar Lambert swept the Capital District in all four competitions to help her not only finish second in the All-Around to Valasek, but power Atlee's team to a second place finish, ensuring the team a trip to states in two weeks. Maddy Greene of Godwin placed 3rd, then Patrick Henry freshman sensation Keion Greenhow finished fourth, qualifying for states with a score of 35.250, besting Madison Godsey of Lee-Davis by just 0.075 points. The first month of 2013 ended Thursday with a hot night of hoops action at Atlee as the Raiders welcomed in the Hanover Hawks for boys JV, girls varsity, and boys varsity games. After the Atlee boys held serve at home with a 51-37 win over the Hawks, the girls took center stage on Senior Night for Atlee's Stephanie Staples and Nikki Gordon. Gordon had two points in the fourth, Staples added 13, but it was Cierra Shelton with 22 points who drove the Atlee engine to a 60-47 Capital District win over Hanover. Hanover took the early lead on a three from Amber Norris and led after a quarter 9-8. The Raiders fought basket for basket through the second until the Hawks broke at 17-17 tie on a Sarah Belcher field goal and free throws by Haleigh Omohundro and April Lankford for a 21-17 halftime edge. Hanover extended the lead to seven early in the third, but a seven-point run by the Raiders, capped off by a Shelton trey, tied the game at 26. Norris responded with a traditional three-point play with 4:14 to go for a 29-26 lead. The lead grew to 36-30 with 1:08 left in third. Then the Raider Run of 2013 began. Staples hit a three. Add another Atlee basket and a missed front end of a one-and-one by Norris and the third quarter ended with Hanover ahead 36-35. Staples hit a two to start the fourth, taking the lead for Atlee for good. Jamari Blackwell's two off an inbounds pass continued the run, and, by the time it finally ended with a Norris free throw with 4:08 to play, the lead was 15 at 52-37. Another eight for the Raiders pushed it to 60-37 with 3:07 left. In six minutes, Atlee had outscored Hanover by an amazing 30-1. The Hawks hit some baskets and free throws in the final minutes to cut the lead but the outcome was no longer in doubt. 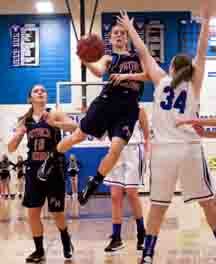 Norris led Hanover with 11 points, while Omohundro added 9. Atlee improved to 4-4 in the Capital, 7-8 overall, while Hanover fell to 2-8, 3-12. The boys varsity game saved the best action for last. Atlee got off to the hot start, hitting 3 from behind the arc for an early 9-2 lead, but the Hawks were patient, whittled down the lead, cutting it to 13-12 after a quarter. Back and forth they went through the second fighting for the lead. With the score tied at 31, Trayvonte Brown, affectionately known by Hawk Nation as "TBIII", drove the lane and hit a floater at the buzzer to give Hanover the 33-31 halftime lead. Brown led Hanover in scoring with 15 points. Atlee spent much of the third quarter playing catch-up, as Hanover built leads of 5 and 9 respectively during the frame. The Raiders cut the 9-point lead to four in the final minute before two Hawk baskets put their lead back at eight at 57-49 after 3. Atlee started the fourth with a quick 5-0 run and the lead was never more than four for anyone. But, in the end, missed free throws spelled doom down the stretch for the Raiders. --Quincy Randolph missed the front end of a one-and-one when Hanover led 59-57. --Atlee got a defensive stop, Brian Miller was fouled, but he made just 1 of 2 free throws. It's 59-58 Hanover at 4:34 and the Hawks called time. --Jalen Elliott drove to the hoop off the timeout, scored and drew the fourth foul on Rashaun Winters. But, Elliott, too missed his free throw due to a lane violation (his shot was actually good), keeping the lead at one possession at 61-58. --Quincy Randolph's three-pointer w/3:09 to go gave Atlee its final lead at 63-61. The Hawks responded with a 4-0 run. --Miller missed two free throws with 2:15 to play when the Raiders were down 2 at 65-63. --The Hawks made a field goal to extend the lead to four again, then Winters drove the lane for a hoop and drew a foul w/1:23 to go. Winters, though, missed the chance at the traditional three-point play by missing his free throw and it was Hanover 67-65. --Winters would, on the next possession, get a steal, fire the ball to Miller, who got the hoop and harm, fouled by Elliott. With 55.5 to go, Miller approached the line with one free throw to take the lead. --He missed. It remained 67-67. As Hanover came downcourt, Randolph forced a steal, saw Miller streaking toward the bucket, but overthrew him. We were still tied, Hanover gets the ball back. --The freshman, Elliott, makes the most of it by drawing a foul and, while the Atlee student section screamed their heads off, he calmly sank the first of two free throws for the 68-67 lead. Then he promptly missed the second shot, Winters rebounded, and the final sequence of events began. As Atlee looked for a shot to take the lead, a held ball occurred on the floor with 12.7 seconds left. The possession arrow favored Hanover. On the Hawks inbounds pass, the fight for the ball ended in one Raider down in pain, a missed foul call, and another held ball, giving possession to Atlee at 8.2 seconds to go. Brett Ayer, the sophomore who hit five three-pointers on the night (he didn't miss any attempts, either) got knocked to the floor hard by a Hawk and withered in pain at halfcourt. No whistle. There could have been and it would have been justified. But that didn't seal Atlee's doom. Their earlier poor free throw shooting, and a key play by Donte Haynesworth were responsible for the final nail in the coffin. On the inbounds pass at 8.2 seconds, Haynesworth went for the second pass of the possession. While not able to steal the ball, he did knock it out of bounds, further downcourt, and took five seconds off the clock in the process. Now Atlee had to inbounds 60 feet from the basket with 3.2 seconds left. The ball got into the hands of Mac Gray who, as you see below, went down the sideline and launched a game-winning three point attempt with 1.3 seconds to go. It was too long, and Hanover had survived in the Rage Cage. Brian Miller led in scoring for the Raiders with 18, followed by Quincy Randolph with 16 and Ayer with his 15. Rashaun Winters had 14 rebounds, nine of them in the first half, seven blocks and a steal. After Brown's 15 for Hanover, Haynesworth and Elliott each added 10 points while Jordan Wade had 9 points and 9 rebounds. Haynesworth's biggest contributions were his seven steals and knockaway in the final 10 seconds to help force Atlee into a tough last shot. The Hawks improve to 5-4 in the Capital, 9-4 overall as they begin a brutal stretch of games. Friday night they host Capital District leader Henrico at 7:30. The Hawks lost to Henrico 99-66 a few weeks ago. The Hawks welcome Armstrong to Hanover for a 3:30 game on Saturday. Then Hanover travels to Glen Allen Monday night and Highland Springs Tuesday night. Atlee falls to 1-8 in the Capital, 3-14 overall, and next battle #2 in the district Armstrong at home Friday at 7:30, followed by trips to Varina Monday and to Lee-Davis Tuesday before hosting Henrico Wednesday. Those Varina and Henrico games are makeups from the January weather disruptions. AS ALWAYS: Follow us on Twitter (@hanoversports) for 24/7 updates on ALL things going on in Hanover County....sports, weather, school closings, interesting hashtags, and who knows what else! 1) Stephanie Staples (3rd from left) and Nikki Gordon (far right) were honored before the game on Senior Night for the girls basketball team.